Organisers says attendance climbed and exhibitors booked more business at the January Furniture Show, which took place at the NEC last month. OAL (Occupation Awards) and LTS (Lancashire Testing Services) are among the new sponsors of this year's edition of London Fabric, which takes place later this spring. Pre-registration to attend the next edition of the January Furniture Show has climbed sharply in a sign buyers are eager to replenish their product offer, organisers have said. Over 85 percent of exhibitor space has been sold with more than three and a half months remaining before the January Furniture Show opens the doors to its 2019 event at the NEC. 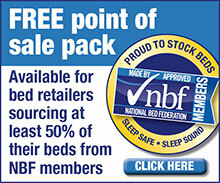 Bed industry trade association The National Bed Federation (NBF) and The Sleep Council, its consumer promotion arm, are official partners to Somnex — The Sleep Show, the UK's inaugural event dedicated to sleep health. The 42nd edition of the China International Furniture Fair in Shanghai (CIFF Shanghai) attracted record attendance across the four-day event, organisers have said. Decorex International, the interior design event taking place in London this week, has announced a new autumn dateline and a change of venue for next year's edition. London Fabric, the trade event aimed at buyers of fabrics for upholstery, beds and soft furnishings, has moved its show dates to avoid a potential fixture clash for venue host, Chelsea FC. London Fabric, the trade show for the upholstery industry taking place in the capital next month, has revealed its full exhibitor line-up after selling out exhibition space. The 2018 edition of the IMM Cologne event launches today with a leap in exhibitor numbers buoyed by a greater number of non-German participants. Organisers of the fourth edition of The Furniture Awards have announced the shortlist in each category ahead of naming winners at the January Furniture Show later this month. A longstanding furniture agents collective will introduce a dedicated beds trade event this spring, aiming to incorporate mattress makers unable to show at its existing autumn furniture show. January Furniture Show has partnered with the Society of British & International Design (SBID) to offer insight for professionals in the furniture and interior design sectors. Organisers of the January Furniture Show have invested in contactless event technology that will help visitors quickly and easily collect information about exhibitors. Visitors can now pre-register to attend the next edition of the London Fabric Show in London after organisers launched the online process. Organisers of the January Furniture Show have announced two tie-ups they hope will strengthen the event's links with the interior design sector. Organisers of the Midpoint Furniture Exhibition have announced the event will combine with The Manchester Furniture Show in 2018. The China International Furniture Fair (CIFF) attracted 91,623 visitors to its September 11–14 edition, a rise of 8.2 percent on the previous year, organisers announced. British bed, sofa and interior design companies were among exhibitors showcasing the cream of UK industry at Best of British Shanghai. Sofa suppliers Vale-Bridgecraft and Siren Furniture have signed to exhibit at the January Furniture Show, bolstering the upholstery offer in Hall 1 of the NEC event.